his is a beginners class that teaches you how to play with your stitching. It requires your sewing machine, a darning foot, and the ability to drop your feed dogs. With the squares you bring prepared, you will learn how to stitch wavy, curvy, fun stitches! Loops, leaves, stars! Oh the possibilities! Unleash your creativity and have some fun with thread! I can't wait to meet you! Requirements: Sewing machine, quilting foot, easy slide mat, quilting gloves. 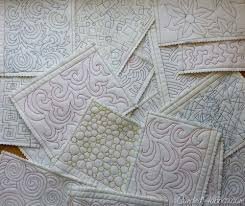 Bring four quilt sandwiches: 8-14" squares of any fabric, 4- 14" squares of batting, contrasting 100% cotton thread.